Vancouver, British Columbia--(Newsfile Corp. - January 18, 2019) - Inomin Mines Inc. (TSXV: MINE) ("Inomin", "MINE", or the "Company") reports it has formed a strategic alliance with Turnagain Resources Inc. to co-market the companies' adjacent Fleetwood and Seneca zinc-copper-silver-gold properties as a combined project named Fleetwood-Seneca. Together the Fleetwood and Seneca properties are a considerably more attractive exploration and development project as the properties consolidate a significant Volcanogenic Massive Sulphide (VMS) district in southwestern British Columbia. Fleetwood-Seneca host the Seneca zinc-copper-silver-gold deposit, the partially-delineated Fleetwood, 33 and Vent zones, and several priority exploration targets within a 6 kilometre by 2 kilometre mineral belt. Any consideration received from a third-party deal, such as an investment or the sale of the Fleetwood-Seneca project, is to be divided equally between Inomin and Turnagain. The strategic alliance agreement was entered into December 21, 2018. The Fleetwood-Seneca project is located within a 6 km by 2 km northwest trending volcanic belt hosting extensive zinc-copper-silver-gold rich VMS mineralization. Exploration in the belt has discovered four Kuroko style mineral zones: Fleetwood, 33, Vent, and the Seneca deposit. These mineralized zones are typical of VMS districts where deposits commonly occur in clusters. Within the Fleetwood-Seneca VMS district, most of the exploration has focused at the Seneca deposit where (in the Seneca Pit zone) the mineralization is associated with dominantly felsic fragmental footwall units known as the ore zone conglomerate. It is a massive sulphide body with a chalcopyrite-pyrite-rich base overlain by a sphalerite-barite-galena-rich zone. Work included 33,000 metres of diamond drilling, underground development and extraction of a bulk sample that was custom milled at the Britannia Mine. This exploration was not carried out under the supervision of a qualified person, nor has a qualified person verified the data; as all, of the written information and reports are unavailable. The only relevance herein is strictly as geological information. An historic estimate of 1.506 million tonnes at a grade of 0.82 g/t gold, 41.13 g/t silver, 0.63% copper, 0.15% lead, and 3.57% zinc for the Seneca deposit is referenced by Arnold (1996), Hoy (1991) and Chapman (1999), without specifying any details, referring to an unpublished 1984 report by Wright Engineers. This report is not available and none of the aforementioned qualified persons have done enough work to classify this estimate as current mineral resources or mineral reserves. This estimate cannot be considered as reliable since it is unknown whether or not it was prepared by a qualified person. In addition, resource categories are not mentioned and assumptions, parameters and methods used to prepare it are not known. There is no known more recent estimate, and much additional drilling would be needed to verify such an estimate. The only relevance herein is strictly as geological information. Neither Inomin nor Turnagain consider this historical estimate as current or as an indication of what might be found on the Fleetwood-Seneca project claim holdings. A qualified person has not done sufficient work to classify the historical estimate as a current mineral resource and is not treating the historical estimate as a current mineral resource. 3. A low intensity magnetic anomaly has not been drill tested in a 500 m section of favourable stratigraphy to the northwest of the Vent and southeast of the Fleetwood zones. The Fleetwood property covers the Fleetwood and 33 zones hosting both stockwork and overlying massive sulphide mineralization, as well as a large EM anomaly. The bulk of the exploration drilling done at Fleetwood was by Minnova Inc., (Minnova became Inmet Mining which was acquired by First Quantum Minerals) that discovered the Fleetwood zone in the early 1990s. As part of their program in 1991, Minnova drilled 41 holes at the Fleetwood zone intersecting significant VMS mineralization including 31.2 metres of stockwork type mineralization at a depth of 153 metres, grading 2.1% zinc, 0.3 copper, 0.1% lead, 8.1 g/t silver and 0.1 g/t gold. At the 33 zone, located 350 metres southwest of Fleetwood, Minnova's drilling returned 23.3% zinc, 1.8% copper, 1.7% lead, 133 g/t silver and 2.3 g/t gold over 3.2 metres at a depth of 170 metres. Minnova's drilling report concluded that further drill testing was warranted at the Fleetwood property. This exploration was carried out by reputable companies, it was not done under the supervision of a qualified person nor has a qualified person verified the data as the written information and reports are unavailable. The only relevance herein is strictly as geological information. Minnova's relatively wide spaced drilling at the Fleetwood zone (200 m centres) leaves room for the occurrence of other mineralized bodies. Northeast of the Fleetwood zone, field work in 2017 confirmed the presence of anomalous zinc and copper values (geochemical sampling by Chevron) occurring within a prominent 1.75 km x 1 km airborne EM anomaly. This Fleetwood EM anomaly is located in rocks higher in the volcanic succession and may represent a stacking of mineralized horizons. A DC IP survey is recommended to further delineate the large Fleetwood EM anomaly as geophysical surveys in the Seneca deposit area demonstrate IP is an effective exploration tool in this environment. Located approximately 90 kilometres east of Vancouver, BC., Fleetwood-Seneca benefits from nearby services, good road access, and excellent infrastructure including an electric powerline on the south end of the project. Additionally, a railway and tidal-barge access are close to the property. "The creation of the Fleetwood-Seneca strategic alliance consolidates a proven VMS district with several polymetallic exploration targets," comments John Gomez, President & CEO of Inomin Mines. "We look forward to attracting a partner to advance the exploration and development of the project." 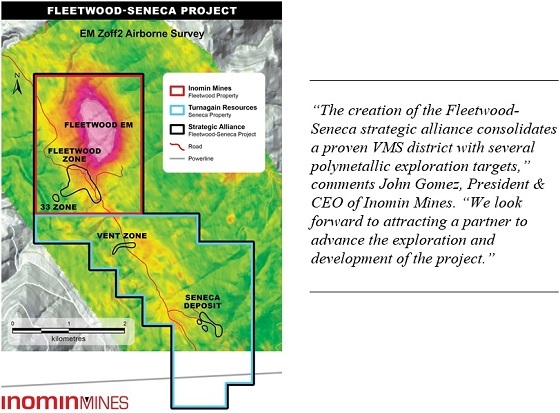 For further information on the Fleetwood-Seneca project visit www.inominmines.com. Subscribe to receive future MINE announcements by visiting https://bit.ly/2pWsA8i. Inomin Mines is engaged in the identification, exploration and development of mineral properties. The Company holds a 100% interest in the Fleetwood zinc-copper VMS project in British Columbia, and the King's Point gold-copper-zinc project in Newfoundland under option to Maritime Resources Corp. Inomin trades on the TSX Venture Exchange with the symbol MINE. For more information visit www.inominmines.com and join us on Twitter @InominMines. Inomin Director Bruce Winfield P.Geo, a qualified person as defined by NI 43-101, has reviewed and approved the technical information in this news release. Neither TSX Venture Exchange nor its Regulation Services Provider (as that term is defined in the policies of the TSX Venture Exchange) accepts responsibility for the adequacy or accuracy of this release. This news release may contain assumptions, estimates, and other forward-looking statements regarding future events. Such forward-looking statements involve inherent risks and uncertainties and are subject to factors, many of which are beyond the Company's control that may cause actual results or performance to differ materially from those currently anticipated in such statements.